Test your flea beetle management skills…. Widespread heavy frost on the weekend was the last straw for many canola fields that were already under stress from previous frosts, flea beetles, wind, dry conditions and in some cases excess moisture. 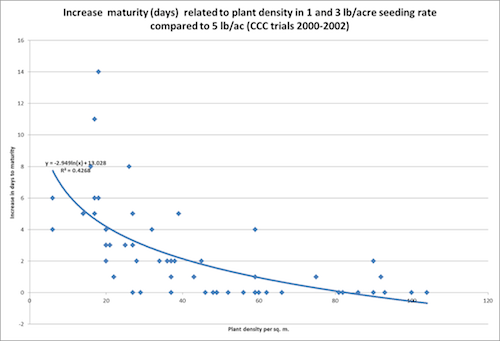 Growers may choose to reseed as a last effort to save what has been a stressful May for some canola crops. However, canola can be surprisingly resilient — as shown in this photo from Terry Betcher of Swan River, Manitoba. Wait for signs that canola plants have started regrowing before spraying after a frost. 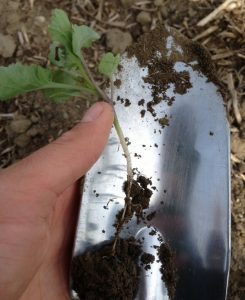 Cutworm scouting begins with a walk through the field looking for bare patches, chewing damage in foliage, or clipped plants. Cutworms and cutworm damage is one thing to look for while scouting this week. 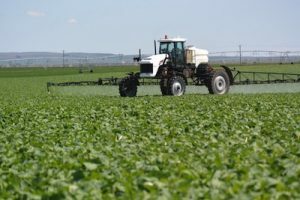 Combining pest control operations to save trips over the field may seem like good economic sense, but consider the following when making this decision…. Did the seeding tool meet expectations this year? A moist soil bed and rain in the days after seeding can make any seeding job look passable. Problems are more obvious when the crop is under stress. (1) Many insecticides have limits on how many times a year they can be sprayed on a canola crop. (2) Check approvals for all products to be used on canola. Step one with a thin stand is to determine the cause so it can be prevented next year. Step two is to scout closely and take extra care to protect those few plants from insect damage and weed competition.